Carne Asada is all about the marinade and this homemade marinade is perfect for steak that will be frozen! It will marinate as it thaws, and then you can pressure cook it to perfection. Once cooked, you can carefully pull apart the meat to add to tacos with your favorite taco toppings! Enjoy! Place the flank steak into the electric pressure cooker insert with the hot water and season with salt and pepper. In a mixing bowl, combine the orange juice, lime juice, olive oil, white vinegar, minced garlic and chopped cilantro. Cook on: Manual/High for 12 minutes. Once finished cooking, shred the beef with 2 forks and mix into the sauce. Assemble the meat into the tortillas with your favorite taco toppings like pico de gallo, guacamole, sour cream and shredded cheese. Serve Instant Pot Carne Asada Tacos with salad and rice. Chop 2 cups of fresh cilantro. In a mixing bowl, combine 1 cup orange juice, 1/2 cup lime juice, 1/2 cup olive oil, 4 Tbsp white vinegar, 4 tsp minced garlic, and the chopped cilantro. You can use flank steak, skirt steak, or beef chuck roast with this recipe. Recipe is dairy-free when served with dairy-free sides and toppings. Recipe is gluten-free when served with corn tortillas, gluten-free sides and toppings. 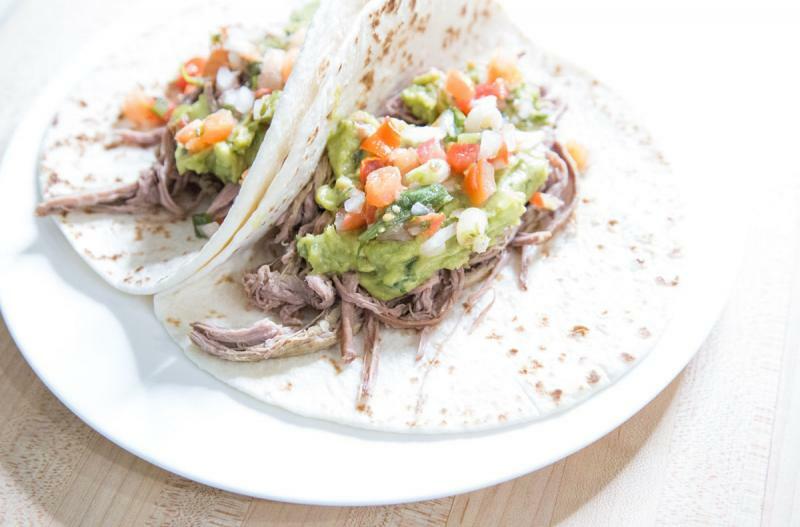 Once cooked, shred the beef with 2 forks and assemble tacos. Serve with salad and rice.